Maybe it’s all of the snow outside, maybe it’s just the simplicity – black and white has been a weekly staple for me this last month. Don’t get me wrong, I love me some brights. But as I’ve said before, neutrals are always a comforting change and lately I’ve been gravitating towards the bold but easy black and white. 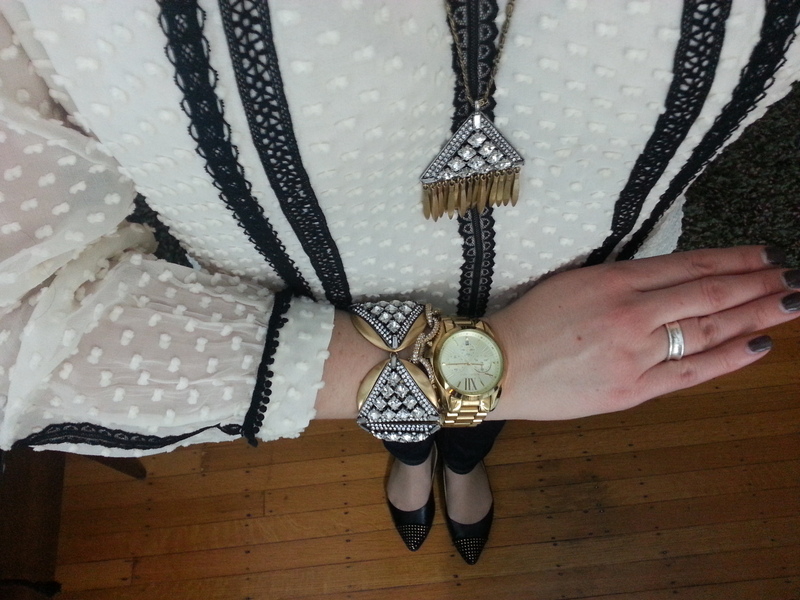 Here’s a few of my recent black and white outfit faves – from work to date night! 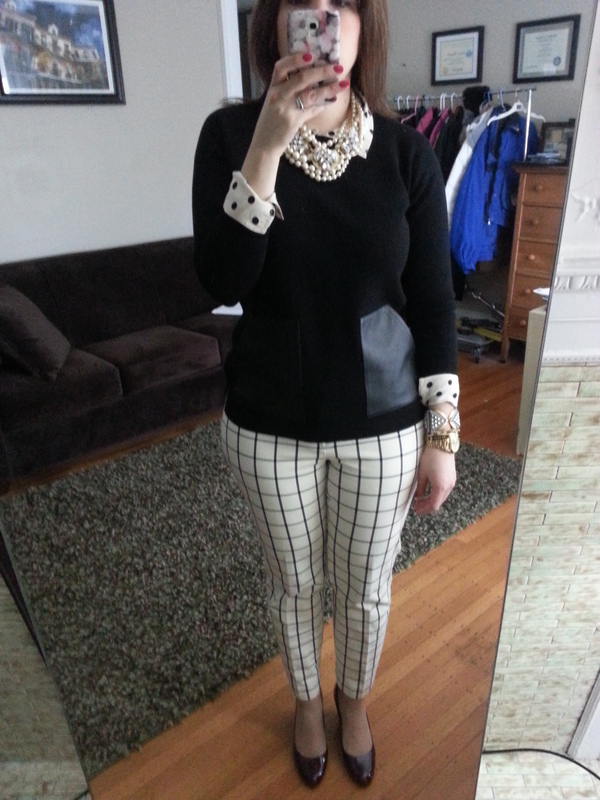 First up…work looks! I picked this Merona blazer up for a mere $11 at my local Target after seeing it on the masses on Instagram. It’s still available online for $24 but it might be worth a look at your local Target’s clearance rack…$10.98 in store! This is the second Merona blazer I’ve purchased this year and I am loving it! For some reason, I had the worst time pairing this one…it’s actually ivory, not white with black dots/trip. This outfit started as a black cashmere turtleneck and my Banana Republic slim cropped Martins for an exceptionally cold and early morning. I’ll be honest, I originally wanted to wear a black turtleneck and pants because I had to be to work so early…but I just couldn’t do it. 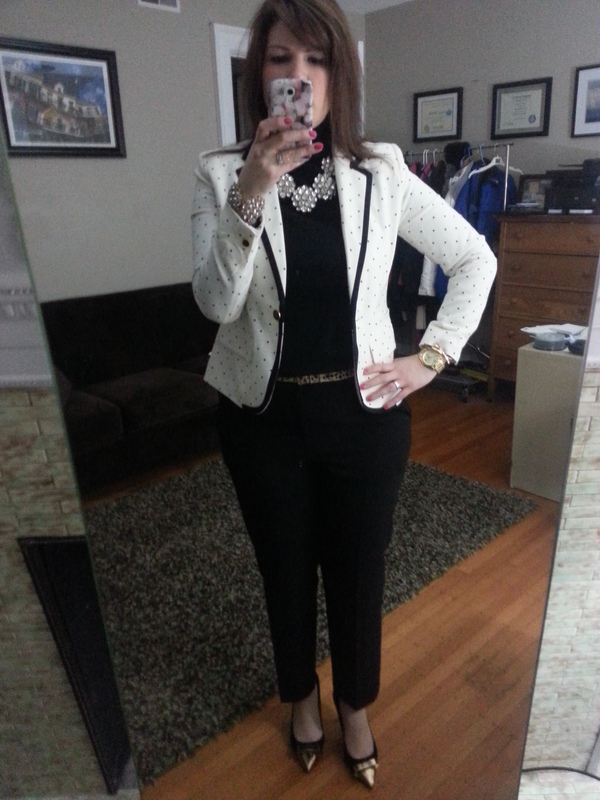 Somehow I worked in this blazer and J.Crew inspired necklace I picked up from Groopdealz. The bracelet is the real deal J.Crew crystal rosette bracelet. And well, another excuse to wear the bow heels, why not? 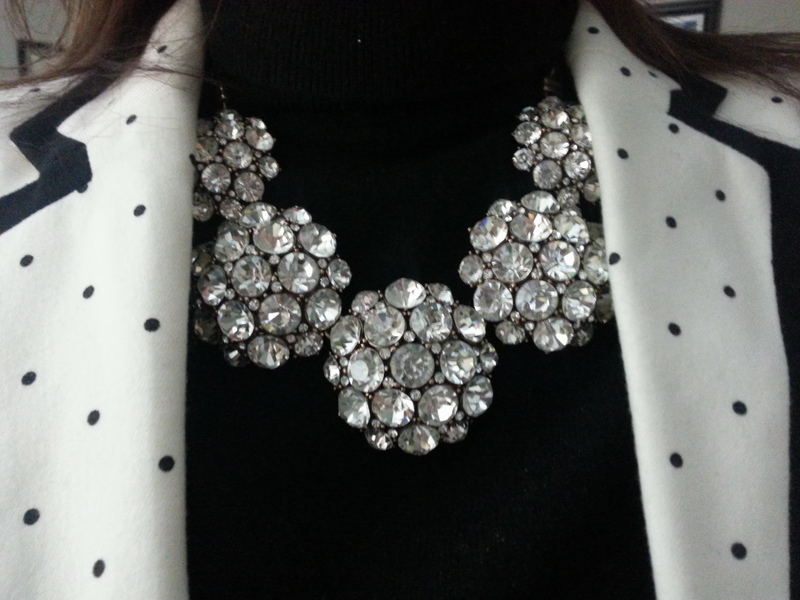 I am in love with this necklace. At first I thought it was too big but…then I asked myself why I would ever think such a thing. And another work outfit…trying to rock these awesome Banana Republic Sloan pants again…which I paired with a J.Crew Blythe blouse and J.Crew leather pocket sweater. Jewels are J.Crew…quickly becoming one of my favorite necklace stacks. 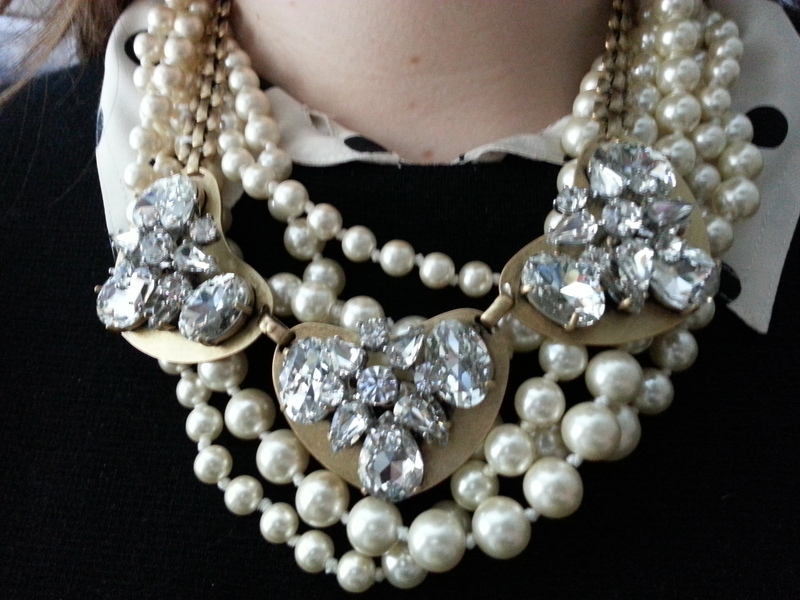 These J.Crew Pearls are a staple in my wardrobe! 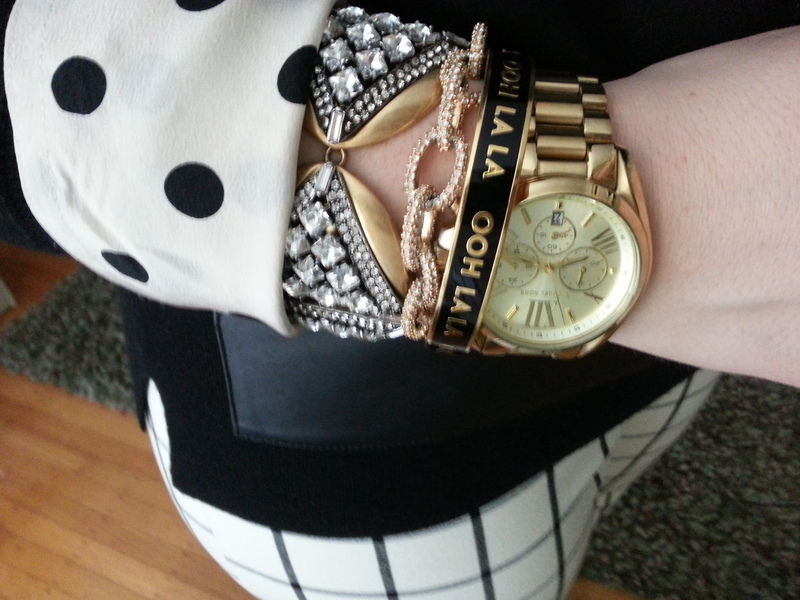 And the bracelets…J.Crew crystal triangle bracelet, Kate Spade bangle, J.Crew Factory link bracelet. And finally…an outfit for a night out! 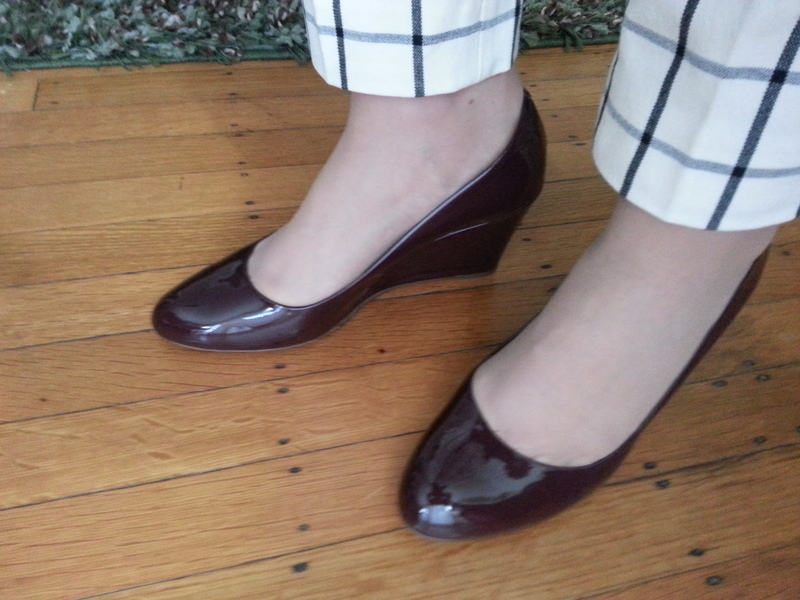 No full shot because I was taking pictures in the evening…loving these triangle pairs! 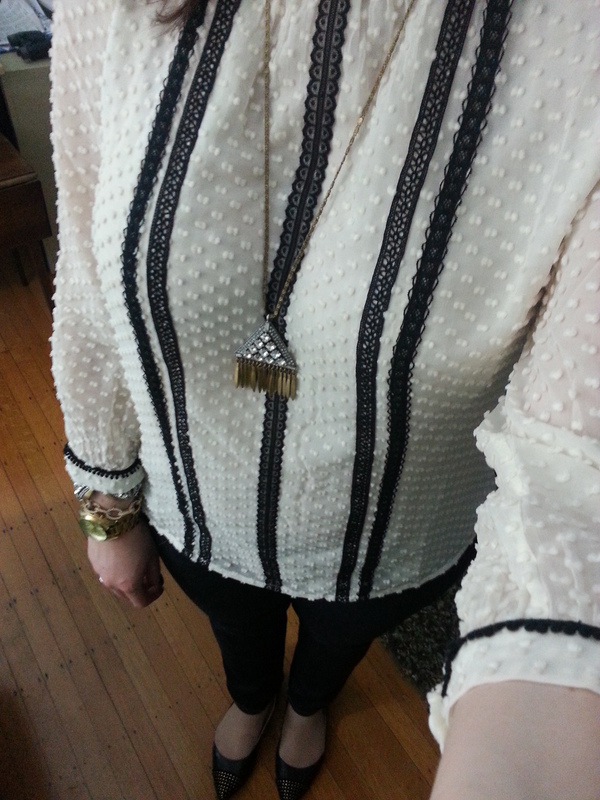 Blouse is the J.Crew Lace-trim swiss-dot top, a surprise love for me! My only complaint about this top is that it buttons up the back…and the buttons are a little flimsy. I wore this outfit when I was out with some friends last week and a random lady walked up to me to tell me half my blouse was undone. Oops. Might have to look at stitching this shut. So there you have it…no color but some great basics. What do you think? Fine as is, or do I need a pop of color? Would love to hear what you think and thanks for visiting! I have the polka dot Merona blazer and I just haven’t worn it as much as I thought I would. I really like how you styled it! Ohmigosh, I totally love your style! I think I’ve considered every item you featured in your post here, and next week I am planning on having a black and white outfit post, too! Thanks for the review on the Merona blazer! Hi, thank you SO much for visiting and taking the time to comment!! Glad to provide some inspiration! !